Honoring the passing of a "Classic"
From 1979 until last year, Bob Bennett was the chairman of the DCI East (now DCI Eastern Classic) committee, a local organizing group of volunteers responsible for providing untold fans and corps members a unique experience second to none in the world of drum corps. With the exception of the first two years, Bennett was the go-to person that kept the Allentown, Pa. show running like no other. According to Fred Windish, who preceded Bennett as the first chair of the Allentown show, Bennett simply sent in a note with his ticket order stating that he'd be interested in helping out, and even though he had never had a connection with a drum corps in the past, he quickly became an integral part of the show that is a premier stop on Drum Corps International's annual tour. Bennett passed away Sunday night following several years of illness. He was 70. According to Jerry Royer, who has succeeded Bennett this past year as chairman for the DCI Eastern Classic committee, Bennett went into the hospital the day after the 2009 Classic. He had hoped to attend the finale of the Saturday night show, but was too sick to do so. 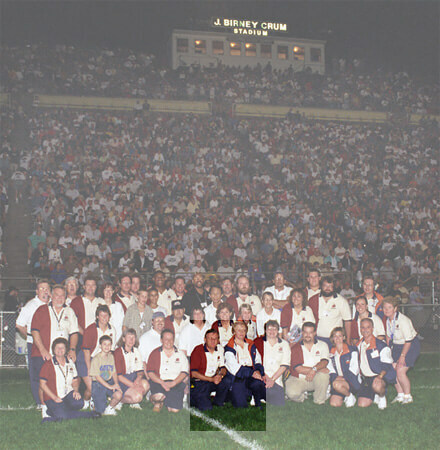 the 2000 DCI East Committee in Allentown. When asked what Bennett meant to the Allentown-based group of volunteers, Royer said, "Bob was the committee. But he was especially regarded for his ability to delegate very well. If there was a problem, he expected each person on the committee to handle the situation. If it got too big for them to handle, then—and only then—would we go to DCI for help." Royer remembers that with as much prep work as the committee did throughout the year, when the day of the event came along, things ran very smoothly. "Once the shows started, everything fell into place. Everyone had their own responsibilities, and no one worried about it." When drum corps fans left J. Birney Crum stadium, they were always greeted by the ticket takers and others, wishing them a good night, thanking them for coming, and making themselves available for questions about directions to restaurants, hotels or other information. Royer says this is because Bennett was a super fan of the Walt Disney Company, as were his experiences during his numerous visits to Disney World. He saw the Disney employees do the same thing and felt that would be of benefit to the fans who attended the Allentown shows. According to Royer, "He saw that as a way to let the people know we cared about them. The spectators were first and foremost to Bob. His biggest concern was that the fans would enjoy a good show." Bennett's committee was intensely devoted to him and the job of making the Allentown shows special for all who would attend. Even when the show had to move to Philadelphia in 2001 while Allentown's J. Birney Crum Stadium was renovated, the entire committee stayed together and made the trek over an hour south to run the show as if it was still in Allentown. Sean King of Youth Education in the Arts worked on the DCI East committee with Bennett for nearly 20 years. "Bob's commitment to a great experience for every spectator and every marching member who walked through the gates of J. Birney Crum Stadium on his watch was undeniable," said King. "He worked tirelessly to instill that same dedication in each member of the committee whether it was their first year or 30th." He remembers Bennett ending every e-mail to the committee members with a comment such as, "DCI East is the best show on tour, and it is you that make it so." King says, "On the occasion of the loss of our great friend, I feel the need to correct that by saying it was Bob who was the reason the DCI East event was the best show on the summer tour." Attending the DCI Eastern Classic in Allentown is an experience drum corps fans remember as being among their favorites. From the helpfulness of all who assist the fans, to the circus-like atmosphere of the souvenir marketplace, the funnel cakes and mega-giant snow cones from the concession stands, to being able to listen to the corps warm-up around the lagoon in the nearby park, being at the DCI Eastern Classic is unlike being at any other drum corps show. Services for Bennett will be held Friday, April 23, at the Moravian Church in Emmaus, Pa. (Main Street and Keystone Avenue). Viewing hours begin at 10 a.m., followed at 11 a.m. with the service. Internment will be two blocks away and a reception will follow at the church. Donations in Bennett's memory can be made to the Emmaus Moravian Church. Remembering Bob Bennett: Allentown Morning Call Obituary Fanfare: How Allentown became "Allentown" Corps on their way to Madison after another successful DCI Eastern Classic Photo courtesy Sid Unser.